From the critically acclaimed author of Amina’s Voice comes the first book in an exciting new middle grade series about a fourth-grader with big dreams of basketball stardom. 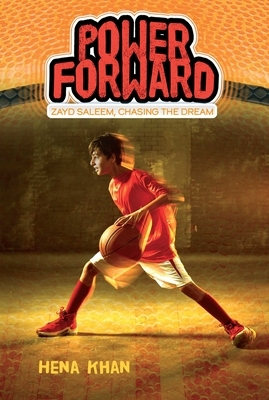 Fourth grader Zayd Saleem has some serious hoop dreams. He’s not just going to be a professional basketball player. He’s going to be a star. A legend. The first Pakistani-American kid to make it to the NBA. He knows this deep in his soul. It’s his destiny. There are only a few small things in his way. For starters, Zayd’s only on the D-team. (D stands for developmental, but to Zayd it’s always felt like a bad grade or something.) Not to mention, he’s a bit on the scrawny side, even for the fourth grade team. But his best friend Adam is on the Gold Team, and it’s Zayd’s dream for the two of them to play together. His mom and dad don’t get it. They want him to practice his violin way more than his jump shot. When he gets caught blowing off his violin lessons to practice, Zayd’s parents lay down the ultimate punishment: he has to hang up his high tops and isn’t allowed to play basketball anymore. As tryouts for the Gold Team approach, Zayd has to find the courage to stand up for himself and chase his dream. Sally Wern Comport has illustrated numerous picture books and novels, including Love Will See You Through: Martin Luther King Jr.’s Six Guiding Beliefs; Brave Margaret: An Irish Adventure; Hanging Off Jefferson’s Nose: Growing Up on Mt. Rushmore; and the Spy Mice series. She has also translated her picture making skills to various large scale public, private, and institutional artworks. Sally lives with her husband and two daughters in Annapolis, Maryland, where she operates Art at Large Inc. Learn more at ArtAtLargeInc.com. "Zayd is a sympathetic protagonist, and his story is told with humor and artfully filled with interesting cultural matter...Readers will cheer for Zayd and look forward to the next volume." "A promising series opener featuring a welcome diverse main character that will appeal to plenty of sports-loving readers."